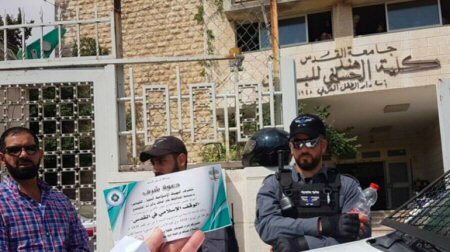 Israeli forces raid a Palestinian academic conference, July 14, 2018. Photo credit: Wadi Hilweh Information Center. One Palestinian was arrested. Over a dozen others were briefly detained and in some cases ordered to appear before Israeli intelligence at a later date. The Israeli minister of public security Gilad Erdan banned a Palestinian academic conference in Jerusalem from taking place on Saturday, July 14, 2018. Israeli forces raided Hind al-Husaini College – al-Quds University half an hour before the event was set to begin there on Saturday and delivered an order signed by Erdan criminalizing the conference. Over a dozen participants were briefly detained and in some cases given orders to appear before the Israeli intelligence officers at a later date. Israeli forces arrested businessman Muneeb al-Masri and released him from jail the following day. Israeli order barring Palestinian academic conference, July 14, 2018. Photo credit: Wadi Hilweh Information Center. The conference, titled “The Fourth Academic Conference on the Islamic Waqf in Jerusalem” was planned as a two-day conference in the Hind al-Husaini College in Sheikh Jarrah. The Jerusalem Waqf, Heritage and Preservation Society and Islamic Supreme Committee – Jerusalem, organized the conference to discuss the heritage of the holy city. Erdan, however, claimed the event was a Palestinian Authority (PA) organized “conference of incitement” meant to “undermine Israel’s sovereignty in Jerusalem” and “fan [the flames of] violence in the city.” President of the Supreme Islamic Council Ekrima Sabri refuted this claim, stressing that this year’s conference was the fourth of its kind and, like those in the past, was organized explicitly by the aforementioned bodies. Such an incident is part of Israel’s ongoing policy that targets Palestinian institutions and undermines academic freedom and education in Jerusalem. Israel’s draconian measures and egregious violations clearly serve its plan to complete the total annexation and isolation of Palestinian Jerusalem,” said the PLO official and academic. Israeli forces routinely shut down a wide range of Palestinian events, get-togethers and organizations under the pretext of PA, political party, or “terrorist” involvement. Israel occupied and annexed 72 square kilometers of land to the Jerusalem municipality in 1967. Palestinians and the international community, however, consider Israel an occupying power in East Jerusalem. Its annexation of the area contravenes UN Security Council resolutions 181, 252, 267, 471, 467 and 478. The international community recognizes Jerusalem’s Palestinian residents as protected under the Fourth Geneva Convention.